Steep your favorite hot tea (green, white or mint is recommended), or a flavored herbal tea, and fill half a mug. Fill the other half of the mug with warm, steamy lemonade. If desired, add a little honey and a drop of peppermint. That's it! A quick and easy cold buster. Wishing you and your family a happy and healthy January! Check back here tomorrow for winner announcement. Josie Riviera is a USA TODAY Bestselling Author of contemporary, inspirational, and historical sweet romances that read like Hallmark movies. She lives in the Charlotte, NC, area with her wonderfully supportive husband.They share their home with an adorable Shih Tzu who constantly needs grooming and live in an old house forever needing renovations. Sign up for her blog on her website and subscribe to her newsletter for a free ebook. And it's not too early to begin thinking about Valentine's Day! 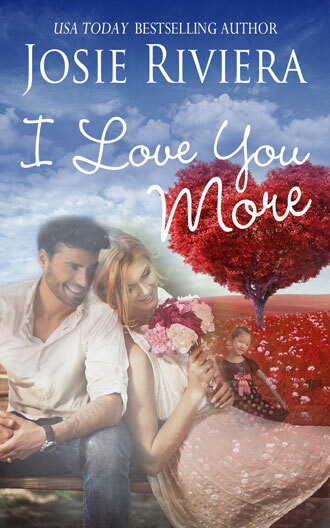 My sweet romance Valentine novella, I Love You More, "reads like a Hallmark movie." Pick up your ebook or paperback copy today! Also available on Nook, Itunes, and Kobo. Sick or well, summer or winter, I'm just a coffee fanatic! I'll tell my mom about this. She has a cold after going to a Lakers game. Let me know if your Mom likes this remedy, Cindy. This sounds kind of gross but effective! I'm going to try this! I'm a tea drinker, Beth, and I like it. Let me know what you think. Too bad I am not a tea fan since I get colds a lot would have tried it but I really dislike tea. I am a coffee gal. I'm a coffee and tea gal, Cassandra. Perhaps one of the flavored herbal teas might be to your liking? I can get sick of tea if I've been sick a while, so I will occasionally put some dried orange peel into a cup of hot water with just a smidge of honey. It's soothing and mild. Thanks for this idea/recipe, Sam. Definitely will try it. Sounds similar to one my Dad used. Sounds good, Margie. I'm assuming it worked for you Dad. Thanks for sharing. I'll have to remember this! Thank you! Thanks for stopping by, Melanie, and welcome! Omgosh! I'm trying this! Wish I had this 2wks ago. Thank you! And yes, super easy!! Woohoo!! Yay! Let us know what you think. When I get a chill I drink hot chocolate laced with peppermint shnapps. Its warms you and chases the cold away. Judy, this sounds like a wonderful warm drink! I am not much of a hot drink person. I do love good hot chocolate, though. I love hot chocolate, too, Marlene, and am sipping one as I type this. I'm going to have Matt try this tonight, maybe it will help him. Let us know if it helps, Tammie. I drink Earl Grey Tea which has bergamot in it and helps with congestion. I will have to try this remedy, ablist. Thanks! That sounds like a safe remedy. I am copying this to try it. Great, Mary. Let us know if you like it. A sincere thanks to everyone for your awesome responses. Marlene Ezell, you're the winner! Please email me at josieriviera@aol.com to claim your free ebook copy of A Snowy White Christmas! Sounds good, Patricia. Let us know if you like it. That recipe is just what I needed. I am forever getting a cold in winter and that hot tea sounds perfect!. By the way, I tried to sign up to following the blog by email and this is what I got: The feed does not have subscriptions by email enabled. Oh my own favorite drink during winter is just hot chocolate with mini marshmallows!! Thanks for the info about the blog, Sharon. We'll check into this. And, I love hot chocolate with mini marshmallows, too! Got it. Thank you Josie. Yay! Thanks for signing up, Sharon!